Websites and social media sites offer museums new opportunities to expand their reach, to increase participant engagement and the likelihood of a visit. 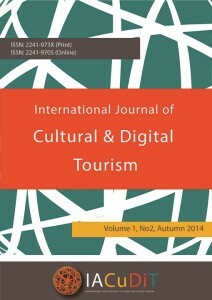 The paper aims at investing quantity and type of information provided by Greek museum websites and use of social media. The recorded information features on websites were divided in six dimensions according to their thematic similarity: Contact-Communication, Visit the museum, The museum, Education, Website features and Use of social media. Next in order to examine how Greek museums use their Facebook profiles to advance their mission and programs, the profiles were evaluated for the presence of features representing ‘organizational disclosure’, ‘information dissemination’, and ‘involvement’. Museums ‘thematics’ is taken into consideration. Greek museums make limited use of the web and do not take advantage of the possibilities offered. The majority of Greek museums use their websites like brochures. Moreover, they make limited use of social media applications. Museum ‘thematics’ have impact only on the information provided on ‘Content-Communication’ and ‘The museum’ dimensions and on ‘involvement’ on Facebook profiles. Impact of other managerial characteristics of the museums on provision of information features and on use of social media should be further investigated. This article examines British images of the independent Greek state and the contribution of travelling to their formation from 1832 to 1870. Its aims are to pinpoint and construe elements of discursive continuity in the image of modern Greece in travel literature and to interpret the travellers’ strong impact on the British reading public. This article argues that the travellers; perceptions of Greek modernity were firmly based on contemporary notions of “civilization” and “national prosperity”, although allusions to classical antiquity always filtered into their accounts. Moreover, the captivity and death of British travellers near Athens, the Greek capital, in 1870 further confirmed rather than altered the existing body of British assumptions about the Greek kingdom and crystallized them into a definite diagnosis of Greek modernity. The standards used in the assessment of Greece’s advance were by no means novel or especially adopted for the Greek case. In early-Victorian Britain “civilization” implied a number of things that Britain was experiencing and valued: industrial development, free trade, material comfort and liberal political institutions. In this article we explore the experience of journeying in postmodern, digital art. On the basis of the assumption that such an experience involves some kind of physical presence, and, more specifically, the physical presence of the work of art and that of its viewer, and that it therefore possesses space and time coordinates and thus activates and is activated by reminiscence, we explore the degree to which digital art fulfills the specific requirements. The offspring of a globalized, post-modernist era, though not of this era alone, a cross between unity (globalization) and fragmentation (post-modernism), digital art, we argue, determined by the medium it employs, fails to comply with the demands of physical presence and, by annihilating time and space boundaries and allowing its numerous, simultaneous viewers/interactants to engulf it in Benjamin’s (1936/1968) terms, by losing its ‘aura’, signals a radical change in the journey requirements referred to above. In the absence of a body, the distance between the work of art and the viewer is gone and the immersion that follows (see Polimeris, 2011) results in loss of the spatiotemporal dimension and reminiscence. The digital or digitalized work of art somehow needs to ‘pay’ for its universal accessibility by becoming impossible to pin down and, thus, ever-elusive. In other words, like the globalised era it is mostly a child of, it paradoxically combines immediacy and timelessness, lethe. We propose a redefinition of this new time and space art journey experience in terms of the Greimasean semiotic square. The following paper presents the project known as “Project for the regional recreational tourist management of rock art sites in the north of Neuquén. Awareness and productive possibilities”, developed in the north of Neuquén province in Argentinean Patagonia and whose purpose is to coordinate the construction of management models through which local communities shall identify the existent relationship between heritage symbols and the community, and its recreational, tourist and productive possibilities. The working team has been documenting and studying various high quality rock art sites for over two decades. Among them there is Colomichicó, considered one of the biggest opencast rock art sites in Latin America. Its systematic studies led to the creation of Archeological Park Colomichicó. For the creation of this Park, the constitution of the Board of Administration was necessary, formed by the Provincial Directorate of Culture and Tourism and the Del Comahue University through Faculty of Tourism to which the research team in charge of every survey assignments elaboration of proposals of enhancement and tourist purpose and belongs. The continuity of the relation of experiences of documentation, signification and preservation of the heritage of cave resources in particular and of heritage in general is of essential importance. The main role of custodians of this is played by local inhabitants with who is necessary to perform a work of awareness and acknowledgement of these resources. The point of view and the special attention paid by the tourist activity to the cultural aspects of the different destinations in the last decades generates the necessity to establish management policies on them, so that its approach and use is performed in optimal conditions of sustainability in order to guarantee its durability over time.